Look! I have actual yarn content! Of course, it’s a mystery as to what it really is, because this is the yarn that #1 Son brought back from Germany in his guitar case sans ball bands. And let me just repeat, gentle reader, how proud I am of him for going into a yarn shop – not his native habitat at all – and making himself understood and finding sock yarn. A very nice present for his mom, eh? I think he did really good. The consensus from those who have seen it up close and personal is that it’s probably Trekking. Unless, of course, it isn’t. As I look at this picture now, I can see that the ball in the upper right corner is slightly larger than the other balls. I don’t know if that means it’s a different brand or just a different type? 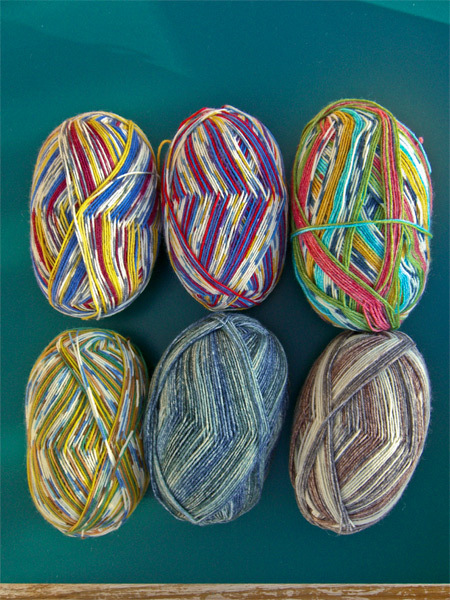 The yarn itself appears to be almost identical. It’s all wool, with maybe some nylon woven in. I wouldn’t call it exactly soft and squishy – not like, say, Dream In Color or Koigu. But it’s not unpleasant and I think it will be nice after washing. I really like most of the colors – they’re growing on me, I will admit. #1 Son wants the upper right corner ball for a scarf. But the more I look at it… He may get the one in the middle instead. We shall see.